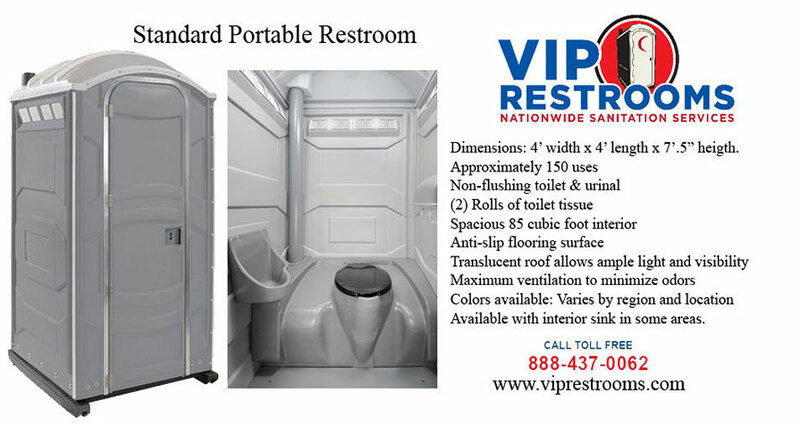 Our standard portable toilet units stand 7.5 feet high and are 4 feet wide. Our standard porta potty is constructed from strong molded plastic. Our units can be locked from the inside. The standard port-a-potty has one comfortable portable toilet seat that sits over a 50 gallon waste holding tank. The collection tank is supplied with a special blue liquid chemical that breaks down waste and foul odor. VIP Restrooms standard porta potty rentals come with toilet seat covers, toilet paper. We also provide you with hand cleaner.